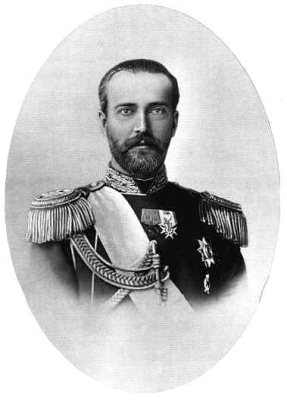 Georgi Maksimilianovich von Leuchtenberg, 6th Duc de Leuchtenberg was born on 29 February 1852 at St. Petersburg, RussiaG. 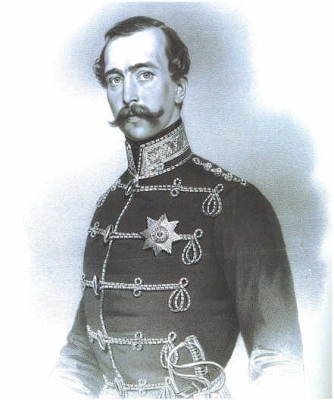 He was the son of Maximilian Joseph Eugène Auguste Napoléon de Beauharnais, 3rd Duc de Leuchtenberg and Mariya Nikolaievna Romanov, Grand Duchess of Russia. He married, firstly, Therese Friederike Olga von Holstein-Gottorp, Herzogin von Oldenburg, daughter of Constantine Friedrich Peter von Holstein-Gottorp, Herzog von Oldenburg and Therese Prinzessin von Nassau-Weilburg, on 12 May 1879. He married, secondly, Anastasiya Nikolaievna Petrovic-Njegoš, Princess of Montenegro, daughter of Nikola I Petrovic-Njegoš, King of Montenegro and Milena Vukotic, on 16 April 1889 at Sergeyevsko Estate, Russia.3 He and Anastasiya Nikolaievna Petrovic-Njegoš, Princess of Montenegro were divorced in 1906.4 He died on 16 May 1912 at age 60 at Paris, FranceG. [S12] C. Arnold McNaughton, The Book of Kings: A Royal Genealogy, in 3 volumes (London, U.K.: Garnstone Press, 1973), volume 1, page 214. Hereinafter cited as The Book of Kings. [S213] Unknown author, "unknown article title," European Royal History Journal: volume 8.6, page 11. Alexandra von Ostenburg, Countess von Ostenburg was born on 4 June 1864. She was the daughter of Nikolaus Friedrich August von Holstein-Gottorp, Herzog von Oldenburg and Maria Bulatzelly.1 She married Paul Vérola on 8 June 1885 at Funchal, Madeira, PortugalG. She died on 23 July 1952 at age 88 at Paris, FranceG. Paul Vérola was born on 13 July 1863 at Nice, FranceG. He married Alexandra von Ostenburg, Countess von Ostenburg, daughter of Nikolaus Friedrich August von Holstein-Gottorp, Herzog von Oldenburg and Maria Bulatzelly, on 8 June 1885 at Funchal, Madeira, PortugalG. He died on 11 April 1931 at age 67. Maximilian Joseph Eugène Auguste Napoléon de Beauharnais, 3rd Duc de Leuchtenberg was born on 1 November 1817 [20 Oct 1817]. He was the son of Eugène de Beauharnais, 1st Duc de Leuchtenberg and Auguste Prinzessin von Bayern. He married Mariya Nikolaievna Romanov, Grand Duchess of Russia, daughter of Nikolai I Pavlovich Romanov, Tsar of Russia and Friederike Luise Charlotte Wilhelmine Prinzessin von Preußen, on 14 July 1839 [2 July 1839 O.S.] at St. Petersburg, RussiaG. He died on 1 November 1852 at age 35 at St. Petersburg, RussiaG. [S12] C. Arnold McNaughton, The Book of Kings: A Royal Genealogy, in 3 volumes (London, U.K.: Garnstone Press, 1973), volume 1, page 218. Hereinafter cited as The Book of Kings. Olga Vladimirovna Ratkova-Rognova was born on 1 November 1878 at St. Petersburg, RussiaG.1 She was the daughter of Vladimir Ratkova-Rognova.1 She married Peter Friedrich Georg von Holstein-Gottorp, Herzog von Oldenburg, son of Alexander Friedrich Constantine von Holstein-Gottorp, Herzog von Oldenburg and Evgenya Maksimilianovna Herzogin von Leuchtenberg, on 3 May 1922 at Biarritz, FranceG.1 She died in 1929 at MoroccoG.1 She was also reported to have died circa 1955 at MoroccoG. [S12] C. Arnold McNaughton, The Book of Kings: A Royal Genealogy, in 3 volumes (London, U.K.: Garnstone Press, 1973), volume 1, page 216. Hereinafter cited as The Book of Kings. Vladimir Ratkova-Rognova was born before 1862. [S12] C. Arnold McNaughton, The Book of Kings, volume 1, page 311.